Our Projector Experts are ready to assist you with your order or to answer any questions you may have between 9 a.m. and 6 p.m. Eastern Standard Time, Sunday through Thursday. We enjoy getting your feedback on our website, and really do listen to your suggestions. BenQ is a Taiwanese manufacturer of projectors, best known in the United States for their home theater projectors. BenQ offers a reasonable selection of business and school projectors, including anything from pico projectors and sub-1 pound “micro-portable” projectors to small commercial projectors. BenQ projectors almost use exclusively DLP technology, although recently BenQ has been adding LCD projectors to its lineup. In the home theater space, BenQ has scored more than their fair share of awards from ProjectorReviews.com over the years. BenQ tends to be an innovator, such as being the first DLP projector manufacturer to offer lens shift on medium and lower-priced projectors. 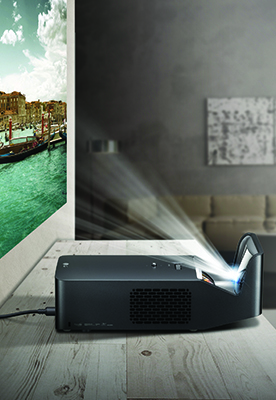 We offer an extensive database to help you find the right BenQ projector for you. Optoma is one of the largest sellers of business and home theater projectors in the United States. With about two-dozen models total, Optoma is perhaps the best known manufacturer of the smallest projectors, the Pico projectors. One of their models took top honors in our recent Pico Projector Report. Search our database, read our projector reviews. Peruse the Optoma resources here. Barco offers projection technology for a wide variety of markets. The super silent DLP business projectors are highly suitable for use in meeting rooms, boardrooms, brainstorm rooms or break-out rooms. Our rugged large venue projectors offer excellent brightness for auditoriums, events, shows and projection mapping projects. For the digital cinema industry, we offer laser-illuminated and lamp-based cinema projectors, as well as post production projectors. Barco’s simulation projectors are the perfect fit for simulation and training, while our 3D stereoscopic projectors are the perfect choice for virtual reality.